Irish Golf Jokes: Get The Edge in Your Next Round - Make Them Laugh! Irish Golf Jokes: Their Uncontrolled Laughter Is Your Secret Weapon! To truly understand the importance of Irish golf jokes, consider this fact: Golf Digest once identified the Republic of Ireland and Northern Ireland as two of the countries with the highest number of golf courses per capita. This is not surprising considering that golf is so embedded in Irish culture, and it shows in our traditions, our landscapes and yes, in our jokes. 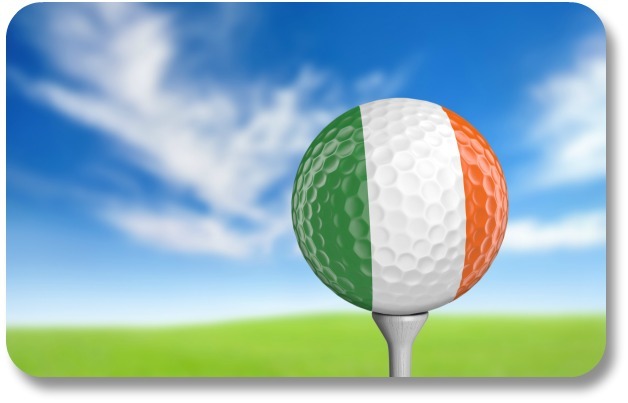 Here is a sampling of jokes to help the golf-lovers among us to express our Irish sides! And for many, many more examples of Irish humor, don't miss our main section on Irish jokes here! Golf is a difficult game to master, and most successful golfers have gone to amazing lengths to perfect their craft. As seen in this Irish golf joke, many have quite literally moved the earth! Paddy was frustrated because he has hit numerous fat shots. In his frustration, he told Murphy, his caddy, “I would move heaven and earth just to make a hundred." As with any sport, mastering the fundamentals requires practice and study. In this Irish golf joke, spelling makes the difference! Kelly, a schoolteacher, was on her first golf lesson and like any schoolteacher, she was meticulous about spelling words. “Is it spelled as p-u-t or p-u-t-t?” asks Kelly. Golf should be an easy game: Hit the ball, get it in the hole and score. But it’s not as easy as it sounds especially when you are standing so close to the thing you should be hitting so far. After hitting the ball with little to no success, Paddy asked his caddy what the problem was with his game. The Irish love weddings as can be seen by their traditional wedding celebrations, toasts and blessings. But nothing compares to the love of a golfer for his or her favorite game. As the bride walks down the aisle, she observes that her groom has his golf bag and clubs by his side. Tiger Woods drives his luxury BMW into a remote petrol station in the Irish countryside. Tiger says hello and then bends down to pick the nozzle. Two tees fall out of his shirt pocket into the ground. Thanks for visiting Irish Golf Jokes! Irreverent humor is an essential part of Irish culture and heritage. Share jokes like these during special occasions to celebrate your personal Irish side! For more information of this type, you may want to visit our main section on Irish jokes here!